Stan Lee was a Jewish American comic book writer, editor and publisher and the former president and chairman of Marvel Comics. Stanley Martin Lieber was born on December 28, 1922, in New York City to Romanian-born Jewish immigrant parents, Celia (née Solomon) and Jack Lieber. Lee grew up in the Washington Heights neighborhood of Manhattan and attended DeWitt Clinton High School in the Bronx. After graduating high school in 1939, he became an assistant at the new Timely Comics division of pulp magazine and comic book publisher Martin Goodman’s company, which would later become Marvel. In May 1941, Lieber made his comic book debut with the text filler “Captain America Foils the Traitor’s Revenge” in Captain America Comics #3, using the pseudonym “Stan Lee,” which he would years later adopt as his legal name. Lee’s first superhero co-creation was the Destroyer, in Mystic Comics #6 (August 1941). Other characters he created, during the period fans and historians call the Golden Age of comics, included Jack Frost, debuted in USA Comics #1 (August 1941), and Father Time, debuted in Captain America Comics #6 (August 1941). In late 1941, when Timely Comics editor Joe Simon and his creative partner, Jack Kirby, left following a dispute with publisher Goodman, Lee was installed as interim editor at just 19 years old. Lee showed a knack for the business that led him to remain as the comic-book division’s editor-in-chief, as well as art director for much of that time, until 1972, when he succeeded Goodman as publisher. Lee entered the United States Army in early 1942 and served stateside in the Signal Corps, writing manuals, training films and slogans, and occasionally cartooning. Lee returned from his World War II military service to his editor position at Timely Comics in 1945. He married Joan Clayton Boocock on December 5, 1947, and the couple had daughter Joan Celia “J.C.” Lee, born in 1950; another child, Jan Lee, died three days after delivery in 1953. In the mid-1950s, by which time the company was known as Atlas Comics, Lee wrote stories in a variety of genres including romance, Westerns, humor, science fiction, medieval adventure, horror and suspense. In 1971, Lee headed the first major successful challenge to the industry’s censorship organization, the Comics Code Authority, and forced it to reform its policies on depicting drug use in comics. In 1972, Lee was named publisher of Marvel, set up an animation studio in Los Angeles, and saw the company eventually grow from TV production into a multimedia giant. Six of Marvel’s superhero films have earned over $1 billion at the box office and total receipts for the studion through 2018 exceed $21 billion. In later years, Lee became a figurehead and public face for Marvel Comics. He made appearances at comic book conventions around America, lecturing at colleges and participating in panel discussions. He moved to California in 1981 to develop Marvel’s TV and movie properties. He has been an executive producer for Marvel film adaptations and other movies. Fans looked forward to his cameo appearances in the superhero movies. In the 2000s, Lee did his first work for DC Comics, launching the Just Imagine... series, in which Lee reimagined the DC superheroes Superman, Batman, Wonder Woman, Green Lantern and the Flash. In 2009, The Walt Disney Company acquired Marvel Entertainment for $4.24 billion. He was also inducted into the comic book industry’s Will Eisner Comic Book Hall of Fame in 1994 and the Jack Kirby Hall of Fame in 1995. 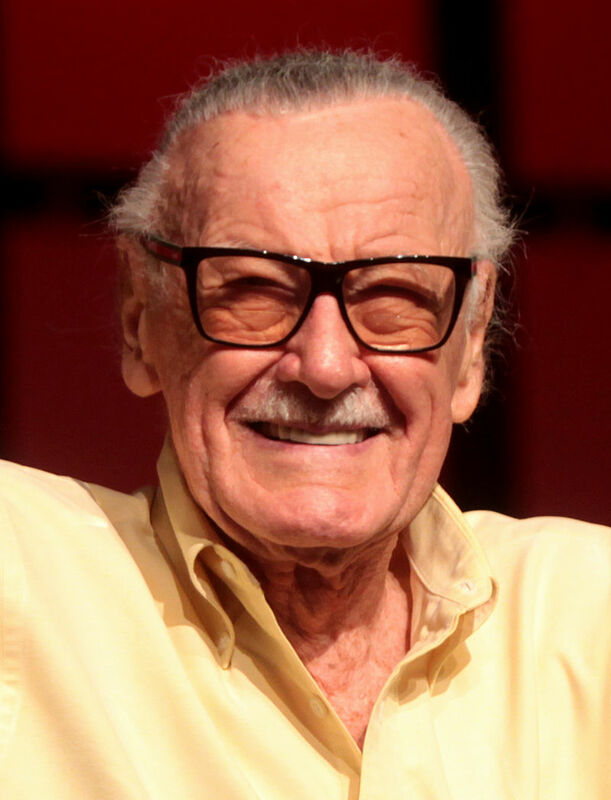 The Stan Lee Foundation was founded in 2010 to focus on literacy, education and the arts. Its stated goals include supporting programs and ideas that improve access to literacy resources, as well as promoting diversity, national literacy, culture and the arts. Lee and his wife of 69 years, Joan, had one daughter, a second child died in infancy. They tried to adopt, but were turned away by numerous agencies, including Jewish ones, which insisted Joan convert to Judaism. After Joan died in July 2017, Lee became embroiled in a series of lawsuits over his fortune and allegations that he was a victim of elder abuse by a man handling his affairs. Lee died at the age of 95 on November 12, 2018. Liel Leibovitz, “Farewell to Stan Lee,” Tablet, (November 13, 2018).